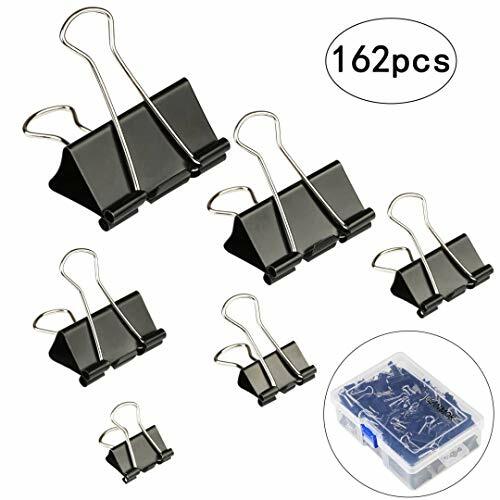 Large Quantity:162 Pieces binder clips in 6 sizes,84x15mm/0.6\'\',36 x 19mm/0.75\",24 x 25 mm/1\",6 x 32mm/1.25\",6 x 41mm/1.6\",6 x 51mm/2\",different sizes file clips can meet your varieties using needs in your daily life. Durable & Reusable:These file clamps are made of tempered steel with a smooth black powder coat and nickel plates handles for an extra-strong grip,durable,rust-resistant and reusable,add value to your business office or home. Transparent Storage Box:These clips are packaged in a transparent storage box.The container is sturdy enough to easily open and store,perfect for you to put these clamps in order when you don\'t need it and prevent from losing the clips.Convenience for organizing your home & office. Office Binder Clips:These paper holder clips keep large stacks of loosing paper securely fastened together without the risk of slipping or fallingout.It can be stick the lable sticker on clip back to sort out your files,whenever you need the documents,it can help you to find what you need in short time. Multi-purpose Clamps:This paper clamps suitable for office,home,school & daily using,especilly for students,teachers to manage their documents,learning materials,not only can be used as bag clips for freezer items that are supposed to reseal,keeps foods fresher longer,but also help to fix or seal some specific things,DIY some useful small tools like phone holder,simple hooks and so on. Perfect! Excited Over Binder Clips!! !